DoPT comment: The Staff-Side says that although the 5th, 6th and now 7th CPC's have recommended that the pay-scales of different cadres/categories/grades requiring the same recruitment qualifications should be the same, denial of the same benefit to the Statistical Assistants (SA's) who are otherwise at par with Assistant Section Officers (erstwhile 'Assistant') is a violation of the principle. While ASO's are placed in the Pay-Matrix 7, SA's are in the Pay-Matrix of 6. 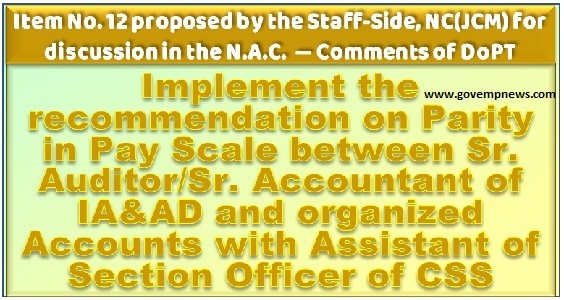 This arrangement is stated to have disturbed the horizontal relativity between the pay-scales of the SA's in the Organized Accounts and IA&AD Cadre and ASO's in the CSS cadre. In conclusion, it has been requested that SA's should also be placed in Pay-Matrix no. 7.